Explore traditional neighborhoods, floating markets and quiet canals on a 5-hour bike tour of Bangkok that includes a scenic ride on a long-tail boat. Get a glimpse of the historical city beyond the touristed areas, finding serene gardens, rustling coconut plantations and small temples where locals come to pray. Enjoy a relaxed pace throughout the day, pedaling 18.6 miles (30 km) on flat, quiet city roads and back lanes. Meet your guide at a central location near Khao San Road, and start the day by getting fitted with a bicycle and safety equipment—infant seats and bike trailers for kids are also included on this family-friendly tour. Visit some of the oldest communities in Bangkok to get a insider's perspective on life in the city. A few miles outside of Bangkok, you’ll take in Taling Chan floating market, where local vendors come with wooden boats full of fresh fruit, vegetables and herbs. Pause for a classic Thai lunch at the market, and soak up the bustling atmosphere and bright colors of the traditional scene. Board a long-tail boat to get views of Bangkok from the river, then hop back on your bike for a laid-back ride to your starting point. 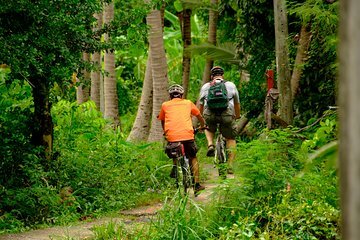 Pedal along the edge of pretty canals, passing temples and kitchen gardens, and see the sprawling coconut plantations that lie at the edge of the city. Finish your day near Khao San Road, close to some of the city’s best places to eat, drink and see.